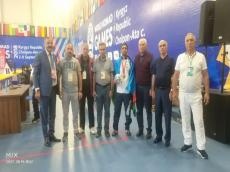 Azerbaijan`s Jalal Suleymanov has won a gold medal in the national wrestling event at the 3rd World Nomad Games in Issyk-Kul, Kyrgyzstan, AZERTAC reported. He claimed the title after beating a Kyrgyz wrestler in the men`s 60kg final. Suleymanov added first gold to Azerbaijan`s medal haul at the 3rd World Nomad Games, which also includes 5 silvers and eight bronzes.